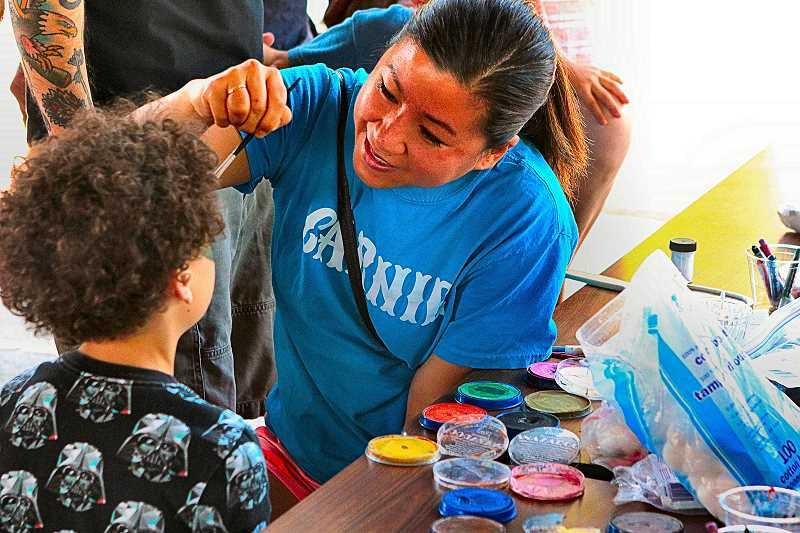 One of the most anticipated after-school activities at Llewellyn Elementary School all year is the annual "Community Carnival", held this year on June 1 – both because it's a giant neighborhood party, and because it's held on the last Friday of the school year! Co-organizer Chris Dolan said he's enjoyed being a "lead carnie" for the past five years, but with his student now moving on to Sellwood Middle School, this was his last year. Four-year Llewellyn Community Carnival leader Georgia Maull reminded THE BEE that she stepped up to help out, and "it's become my job every year, and with a second grader here, that will likely continue!" "The carnival is a really great 'end of the year' event; there's a lot of pre-vacation energy pent up," Maull smiled. "Here, kids get to let out their exuberance in a really fun and safe setting." Almost all the booths at the carnival are run by community businesses and organizations, Maull pointed out. "We're so grateful for their support all year long, and also for being here with a bounce house, races, a cakewalk, a sack race, a paper airplane building area, 'crazy hair', and face painting!" As many as 45 parent volunteers pitch in to make it a success, Maull said. "And, with food vendors from our local businesses, it really makes the carnival complete." Just before sitting down for his session in the Water Balloon Booth, Llewellyn Principal Joe Galati was all smiles. "This is my fifth Carnival, and every year it just gets better and better. The best part is to see more of our community come out to join with us; because this is what it's all about: Building community, and adding new relationships. "This is how we close out a year!" Galati exclaimed -- just before being thoroughly splashed by the first water balloon of many.